What do we mean by reimagining punishment and justice? Researchers, practitioners and people who have experienced criminal punishment challenge our assumptions. Read on . . .
Buy your own magazine quality copy for $9.80 (about £6.80) from our MagCloud site. The copy should be delivered within about a week from placing the order. Download a complete a free .pdf of the whole issue. Printing off is best done in colour. 4MB. If you like the SJM help us keep going by giving a donation for the amount of your choice using the big purple button on the right, buying print copies or subscribing for 3 issues a year. 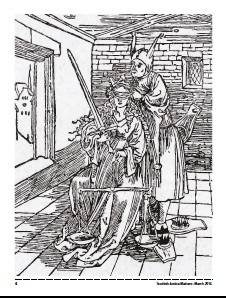 Bill Munro traces the history of the familiar image of blindfolded ‘Justice’ and what it suggests in terms of the relationship of justice to political order, and the relationships between the individual and the state. Blind Justice: what does that mean? Prison-University reading groups. The HMP Greenock and HMP Shotts prison-university reading groups are reimagining justice through education.”Reading groups arean ordinary activity that can create an extraordinary space of interaction”. Rachel Thain-Gray, Rebecca Jones and Margaret Malloch look at gender, justice and sectarianism in Scotland with a focus on the ‘Mixing the Colours’ project at Glasgow Women’s Library. Evictions as punishment for poverty and the contradictions between housing practice and policy in Scotland, are the concerns of Joe Crawford. Is a universal housing allowance the solution? Belén Olmos Giupponi on the lost dream of a ‘world without borders’ and the current criminalisation of migrants and refugees. Philosopher Antony Duff argues that we should try to reimagine criminal punishment as a more constructive, more humane approach to crime that does justice both to victims and offenders as members of the civic community. Pete White likes a lot of what Antony Duff says but has been struggling to think how the ideas might work out in practice – and Antony responds. 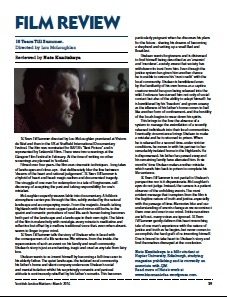 Mike Nellis tests recent developments in Scottish criminal justice against the idea of penal reimagining: ” . . . it is important that CJSW (criminal justice social work) finds the courage to reimagine its better professional self and rise to the challenge of the times”. 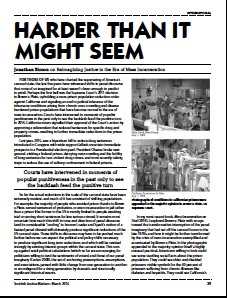 Jonathan Simon, Professor of Law at UC Berkeley, reimagines justice in the era of mass incarceration in the USA with reference to his latest research: “Today’s crisis of mass incarceration in the US(and parallel developments in the UK and beyond) opens a crucial opportunity to reimagine what we want from penal justice in contemporary democracies”. Cyrus Tata asserts that if we really want to reduce the prison population in Scotland a presumption against short sentences is not the only way forward. 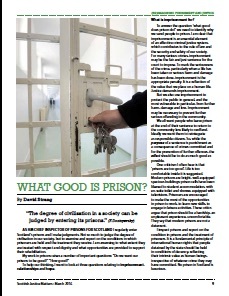 How can prison sentencing be reduced in Scotland? The Scottish Sentencing Council was launched in November 2015. Ondine Tennant explains what it is, its aims and how it will approach its work. Working with the Wise Group, Sharon Mercado shares her experience of mentoring young men on their release from prison and the challenges they face: ” . . . for most it can seem like their punishment continues after leaving the prison gates”. Joanna Shapland of the Scottish Restorative Justice Forum announces the formation of a new RJ practice network and how you can join it. #RJin Scotland. 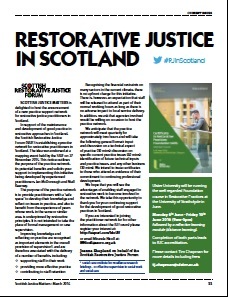 Restorative Justice in Scotland – launch of practice network. PhD researcher Ben Matthews gets to grips with statistics to explore if there has been a real drop in offending behind the recent fall in numbers of people coming to court and concludes that the story is more complex than might first appear. Criminal Justice Social Worker David Orr reviews Beth Weaver’s new book on ‘Offending and Desistance.